One might like Microsofts range of products or not, at work the mail system is Outlook. Perdiod And combined with Exchange this gives some quite capable system for collaborative work. But as always there is room for improvement. So, in the following my customizations to Microsoft Outlook 2013 for Inbox Zero are shown. All mail in one single folder. This is the normal situation which many people work with. As a result, such a single folder contains mails that are read or unread. Mails which are there just for archive purposes, mails that act as reminder for something and finally mails which need to be acted upon or which need to be answered. For me such a system only works well if the daily number of messages is low. Yet, with a busy work schedule and lots of mails as I encounter from time to time, this is seldom the case. If the number of mails increases or if mails often need to be dealt with in a longer time frame – e. g. an answer needs to be sent next month – I quickly need to rescan hundreds of messages and hunt for the mails which are still important. This is time consuming and annoying. I do not treat the Inbox as a physical folder but use Filtered Views or Smart Search Folders. All newly arrived and hence unread mails are briefly read. All read mails that do not require any action or that are for information purposes only are moved elsewhere. All read mails that only require a quick answer or that can be dealt with in a couple of minutes are processed right away and are then moved elsewhere. All read mails that I will deal with today or that provide information which I will need to access today again are left in the Inbox. All read mails that I will deal with later on are marked as deferred with an appropriate due date. I always see only the information which is of importance to me right now. Deferred mails come back into view at due time and can then be processed or be deferred again. Completed mails are simply flagged as completed and are no longer shown. Read mails left in the Inbox for easy reference need to be moved once this reference need is no longer given or might be postponed.Periodically, all completed mails which are still present in the Inbox yet are not shown in the Inbox View are moved to the correct locations. For me, this approach works even under heavy mail load. It drastically reduces the clutter in the Inbox and gives a nice overview over all relevant and required actions. The maintenance tasks, i.e. archiving of completed mail actions and moving reference mails, are either easily done or are done periodically in burst mode. So, how does this work in Outlook? Basically, I do use a custom view to dynamically select only the mail items relevant for me now. For this rather complex query the Outlook SQL DSAL notation is the only option I am aware of. Here, we collect or join all mails via the SQL OR statement that are 1) unread, 2) without a message flag, 3) where the flag was set and deleted, 4) have a flag or category yet no due date. Of all these mails, only (AND statement) mails are shown that A) do not have a due date, B) are not marked as done or completed. For the last checks the inoffcial proptag 0x10900003 is queried. Voila. Save and assign to a custom folder represation and you are ready to doe Inbox Zero the incunabulum way. For the assignment of due dates, categories etc. another blog post will follow. And – btw – one of the first steps on any new computer is to disable the new mail notification actions. For me, email is an asynchronous means of communication where I decide – based on my current tasks and mood – when and how often I want to check my mail. For urgent matters, there is always the phone or personal communication. This entry was posted in general, it, work on 06/01/2014 by mz. Yes, Owl2Java, my java-based code generator for the comfortable access to OWL ontologies from java is no longer maintained by me. As I am now working in a totally different field of application and due to some very limited spare time, I am just and simply not able to do any maintenance. Nevertheless, from time to time it is quite interesting to see, what other are doing wiht this public piece of code, see e.g. my previous post. Well, things are calming down which is not surprising for a software that is unmaintained for so long. Yet, there are some activities up to 2012 in the repositories here and there and I even got some references in the odd paper like e.g. Sapphire: Generating Java Runtime Artefacts from OWL Ontologies by Graeme Stephenson et al. And yes, my work even got referenced in a book, namely the proceddings from Semantic Web Rules. But I guess thats about it. Dead is dead. Farewell. This entry was posted in semantic-web, work on 02/04/2013 by mz. Was lange währt wird endlich gut. 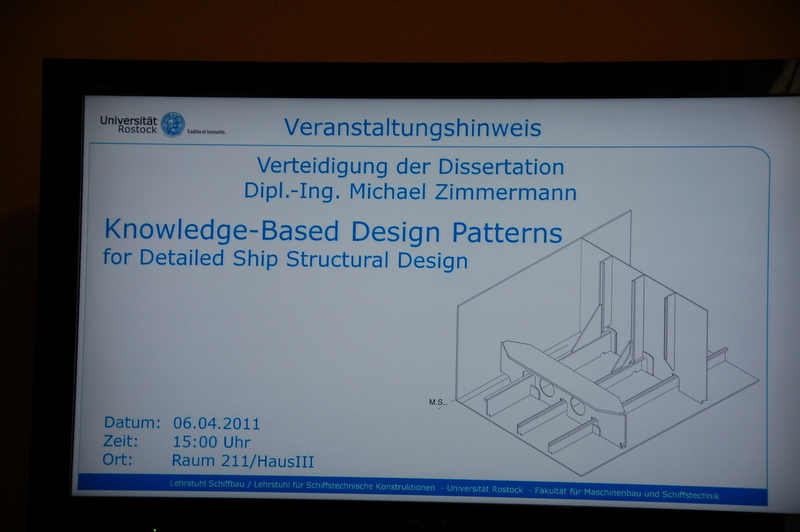 Unter diesem Moto konnte am 6.4.2011 die Verteidigung meiner Dissertation Knowledge-based Design Patterns for Detailed Ship Structural Design stattfinden. 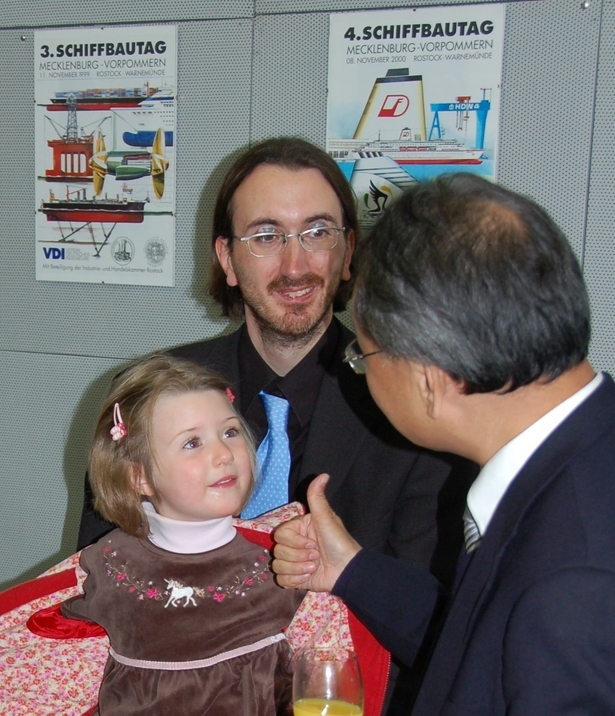 Was im Herbst 2003 begonnen hatte konnte nach Arbeitswechsel, Familiengründung und weiteren Höhen und Tiefen somit abgeschlossen werden. Mit Erfolg! Für Interessierte gibt es einige weitere Bilder. Die Arbeit ist online verfügbar. This entry was posted in life, work on 07/04/2011 by mz.